#!/usr/bin/geek: Google Talk Now Available and Easter Egg Uncovered! Google Talk Now Available and Easter Egg Uncovered! 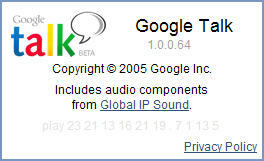 After much speculation and rumor, Google has just launched its IM/Voice Chat product, Google Talk. Rumors flew throughout the day until the application was officially announced in a cryptic message sent to those connected to Google's test jabber server. The client is currently for Windows only, but other platforms can connect using other Jabber and IM clients. I love me an easter egg!